This year’s Star Count (see here) goes live tomorrow (Saturday, February 2). Organised by CPRE, it gives you the chance to become ‘citizen scientists’ by taking part in a cosmic census helping to map our dark skies. The nationwide Star Count, supported by the British Astronomical Association, runs for the first three weeks of February (until Saturday, February 23). Wherever you are, you’re being asked to count the number of stars you can see with the naked eye within the constellation of Orion. As well as promoting dark skies and engaging people in the wonders of stargazing, CPRE aims to highlight the blight that light pollution is causing our dark skies and its impact on people and nature. Not only does light pollution prevent people from enjoying the beauty of a starry sky, it can disrupt wildlife behaviour and affect people’s sleeping patterns, impacting on physical and mental health and well-being. 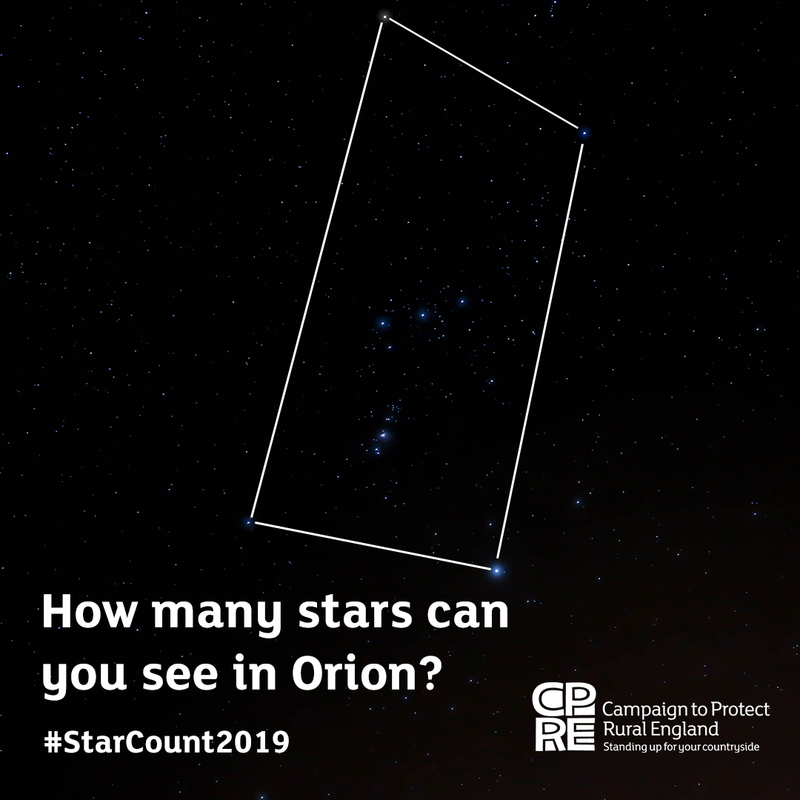 Emma Marrington, dark skies campaigner at CPRE, said: “A dark sky filled with stars is one of the most magical sights our countryside has to offer and for thousands of years our night sky has been a source of information, fascination and inspiration. “Increasingly, however, too many people are denied the opportunity to experience this truly natural wonder. “We want as many people as possible, from right across the country, to get out and get involved with Star Count 2019. Bob Mizon, UK coordinator of the British Astronomical Association Commission for Dark Skies, added: “Star counts are not only fun things to do in themselves but also help to form the national picture of the changing state of our night skies. CPRE will use the results from Star Count 2019 to create a new map showing how light pollution is affecting the nation’s views of the night sky. Our Night Blight maps, based on satellite data, showed that just 22 per cent of England is untouched by light pollution and that more than half of our darkest skies are over National Parks and Areas of Outstanding Natural Beauty. Through the Star Count, we will be able to provide more detailed and up-to-date information on the impact light pollution is having on people’s experience of dark skies. With this information, CPRE will work with local and national government to ensure that appropriate lighting is used only where it’s needed – helping to reduce carbon emissions, save money and protect and enhance our dark skies.